You have the option to like Khushwant Singh or dislike him, but it is difficult to ignore him. Like many Indians of my era, I read his books and the Illustrated Weekly. His wit and writing style had a deep impact on me. Later when I started writing ‘middle’ articles for newspapers, twenty odd years ago, I suspect I was greatly influenced by him. I spent a very large part of my service in the Defense Headquarters in Delhi. Long and drab meetings and conferences were a regular feature of our daily routine. Ever so often, officers were called even when they had very little to contribute. It was like the Indian Parliament. It has 542 members but someone told me that more than half of them complete their term without uttering a single sentence in the Lok Sabha. During one such unending meeting, I jotted down a piece which later appeared in a national newspaper. Recently, while going through my papers, I found what I sent to the editor. Permit me to share it with you. The conference should have begun at 10 am, and it did. At the stroke of the hour, the Chairman trooped in with his staff officers and after the traditional photograph, the secretary read out the first item on the agenda. The last sentence of the prepared text was interrupted by the chairman who embarked on a lengthy discourse on that contentious issue. His explanation was embellished with anecdotes and case-studies from his rich and varied experience and he emphasized on the need to arrive at a ‘balanced’ and sagacious decision in the best interest of the nation and the army. After that, he sought the views of the participants. There were views and counter-views and the discussion went on and on. After what seemed an eternity, the chairman summed up the discussion and suggested that more information must be gathered from the lower formations and analyzed. He said that the issue would be considered at a later date. The clock in the Conference Room showed 10:45, when the second item was read out. There were 19 items on the agenda and my personal involvement was restricted to the issue listed at item number 17. I, therefore, adopted a more comfortable posture and decided to watch the proceedings, dispassionately. I observed how some of the officers present were keen to make their presence felt; they merely re-stated what the ’boss’ had said, in their own words. From the vigor with which some of them vociferously endorsed the opinion of the chairman, it was evident that they were directly under his command. And when someone was snubbed by the ‘chair’ I saw a palpable glee on the faces of his professional rivals. I also observed that more than half the talking was done by just one person: the Chairman. The members were often told to be brief and succinct by the Chairman. I started noting the time which the different items on the agenda took. When we got up for tea at 11:45, only three issues had been discussed. Judging by the progress, I surmised that the agenda would need a minimum of three sittings to go through. Fortunately, I was mistaken. After tea, the pace quickened, and even though only ten items had been considered at One O’clock, the meeting was over by lunch time. The last 10 items were waded through in less than ten minutes, without me getting a chance to speak a single word! Immediately after the meeting (and mating) nothing really happens. There is a bit of cleaning to be done, and you get to know the outcome, if any, in due course of time. The final result takes even longer. Both these activities occur more often during winter than summer. When a new boss assumes office, or soon after marriage, meetings and matings are more frequent and vigorous. The intensity tapers off thereafter. Overtly, it may seem that there are only two participants in the process of ‘mating’ whilst the meetings are attended by a large number of members. However, this is a mere illusion. In the meeting also, there are only two parties: the Chairman on the one side and the rest on the other. I have already mentioned that more than half the talking was done by one single person. This piece will be entirely incomplete, if I do not make a mention of a category of meetings which are peculiar to the military. These ’meetings’ have no formal agenda, and are convened by the Commanding Officer merely to assert his authority. The participants are expected to be ‘seen’ and not ‘heard’. The views of the junior officers are of no consequence. No prize for guessing the equivalent of such ‘meetings’ in the ‘mating’ game. I may also add that, whereas use of force in the pursuit of the amorous activity is an ‘affront to human dignity’ and is liable for capital punishment under the law of the land, the Defense Service Regulations take no cognizance of ‘meetings’ of the kind described above by me. From this discussion, derives the ‘Surjit’s Maxim’. It says, “If a meeting be inevitable, sit back and ‘conceive’ a ‘middle’ article! To pay respect to the retired old fogies, some kindly senior officers call them over for a ‘conclave’ which is attended by the incumbent Head of the Arm or Service. 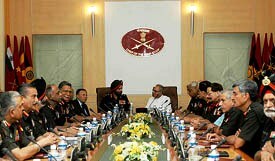 Here is what the ‘torchbearers’ look like when they are given the privilege of being ‘heard’ by the serving top brass. We were harassed by Mr. Khushwant Singh when he was invited to our exhibition in India Habitat Centre. Regarding Khushwant Singh Ji, I had a really bad experience. He was invited to exhibition of our class in Delhi University as a Chief Guest. A classmate and a relative of a well known Punjabi writer went to accompany him. But that day he refused to come to the exhibition except if a female student came to his house. But the other guest, who was a psychologist, came easily without much ado. So no those of us who were there were shocked and do not like him. Surjit, I have been an admirer of your writings ever since your first book “Ik si kudi Neelam” and collection of short stories (or should I say episodes) in English. You have a great style of your own which makes reading your ‘works’ thoroughly enjoyable. Look forward to reading more of your ‘middle’ articles/books. I do not think that laxman rekha has been crossed. Excellent comment. I agree with your comment. I HAVE NOT FOUND ANY SEMBLANCE . YOUR STYLE IS PAR EXCELLENT.FORGET KHUSHWANT. CALL IT THE —-SURJIT SHARES. I like the way Kushwant Singh writes. It is direct, pithy, honest and sentences are constructed simply and one never has to read it twice to get the meaning.So if you can write like him you are a good writer.I wish I could write like him. I appreciate you views and tend to agree with you for most of the statement . I liked your linking meeting and mating (both with the Panjabi pronunciation). Perhaps the functioning of a committeecan be liken to shitting – first there’s a sitting, then a report before finally the matter is dropped. Surjit, lest you take over from him. 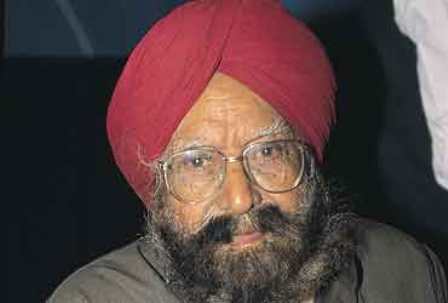 MAY THE ALMIGHTY BLESS SIR KHUSWANT SINGH JI . To Bosey Hum Ne Bhi, Uss Sang-E-Aastaan Ke Liye”. Hazar=sacred stone, Bosey=kisses and Sang-E-Aastaan=window sill. Shab Bhar Tatoltey Raho, Milti Nahin Kamar”. Huraan-E-Khulad=nymphs in heaven and Shab=night. Khushwant is Khushwant. But there is surely no harm in trying to follow in his footsteps, or be influenced by him. In fact it is likely to result in a lot of good writing, as can be seen. Your writing also reminds me of the Martian who came down to earth and wanted to know how human beings are produced. Having been shown a demonstration (demo), the Martian asked to be shown the outcome. “For that we have to wait nine months”, the Martian was told. “Well, in that case what was all that hurry about towards the end?”, asks the puzzled Martian. You’re getting better at following the Khushwant style ! BTW it’s a compliment , not an accusation.